For most of its 17-year history, West Oakland-based City Slicker Farms grew food on borrowed land. Relying on the generosity of landowners, a strong network of volunteers, and deep relationships in the community, City Slicker was able to produce around 30,000 pounds of fresh produce annually to address the high need of low-income residents living in an industrial neighborhood without a full-service grocery store. The farm sold affordable produce at weekly farm stands on a “pay what you can” basis. As a food justice project, City Slicker Farms also trained youth and adults to be able to grow and cook their own food, creating a strong network of school, community, and backyard gardens and gardeners. However, the lack of a permanent piece of land meant that the organization had to periodically dig up and relocate some of their garden plots. When the housing market collapsed in 2009, an opportunity arose to purchase a 1.4 acre parcel of land at Peralta and 28th St. The organization took a chance, and in 2010 applied for and received a $4 million grant from the State of California Department of Parks and Recreation to buy and develop the site into a permanently protected public green space. However, for a small grassroots organization with an annual budget of less than $500k, managing a $4M project was an enormous undertaking. “Getting the grant was a big wake up call,” states Spencer. One challenge was that California’s State-level grants are paid as reimbursements, meaning that City Slicker had to come up with cash for land acquisition and construction costs in addition to raising their annual operating budget. In addition, the state’s practice of withholding the 20% of the grant, in this case $800,000, until final inspection of the project is completed, was infeasible for small grassroots organization like City Slicker. 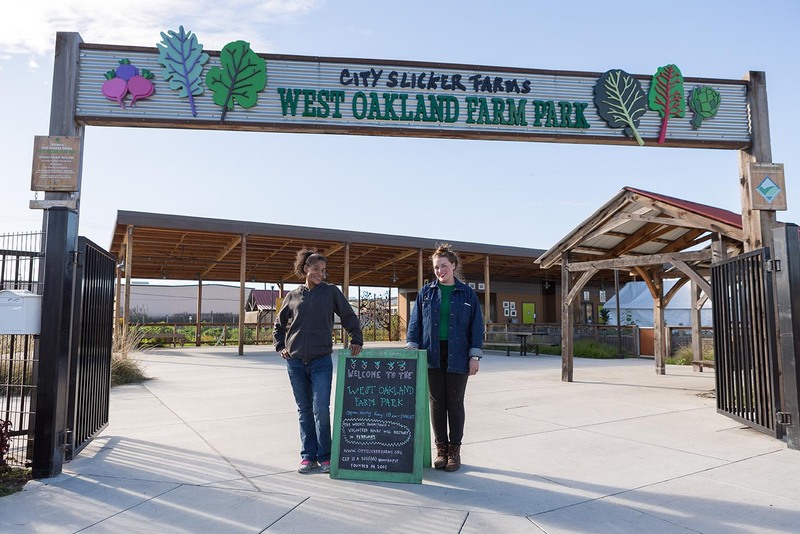 Though these seemed like insurmountable financial barriers, City Slicker was driven by a commitment to the people of West Oakland and forged ahead with an extensive community-led process to design and plan for the visionary Farm Park. Following City Slicker’s progress over two years, Kawar saw an opportunity to provide a bridge loan to help the organization manage the reimbursement aspects of the State grant. Bringing over 35 years of deep experience working with nonprofits, NFF became not just a lender but also an important partner in navigating a complex project ‒even negotiating terms with the State to reduce the final grant holdback down to only 10%. When the West Oakland Farm Park finally opened in 2016, it quickly became a hub for community gatherings and activity. “It’s ground zero for culture,” Spencer enthuses, “We have so many different cultures that come to enjoy the park and then discover the farm.” The park is open to the public every day and City Slicker has an office with staff present on weekdays and Saturday mornings. Residents can now enjoy a playground surrounded by fruit trees and beds of fresh vegetables, an outdoor classroom and demonstration kitchen. There are also 28 community garden plots, a farm business project with students from a local high school, and egg-laying chickens and honeybees. Spencer dreams of a future where communities are self-sufficient and neighbors help feed each other. Growing up in rural North Carolina, he witnessed people growing their own food and raising animals to feed themselves and their neighbors. “We were poor but not hungry,” he explains, emphasizing “In a place like Oakland where you can grow food year-round, no one should be hungry.” He envisions cities where fresh, culturally relevant food is growing everywhere from street medians to parks and people join together in the project of feeding each other.